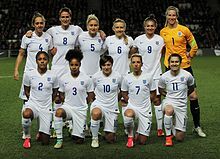 The England women's national football team has been governed by the Football Association (FA) since 1993, having been previously administered by the Women's Football Association (WFA). England played its first international match in November 1972 against Scotland. Although most national football teams represent a sovereign state, as a member of the United Kingdom's Home Nations, England is permitted by FIFA statutes to maintain its own national side that competes in all major tournaments, with the exception of the Women's Olympic Football Tournament. England have qualified for the FIFA Women's World Cup four times, reaching the quarter-final stage on the first three occasions in 1995, 2007, and 2011, and finishing third in 2015. They reached the final of the UEFA Women's Championship in 1984 and 2009. The success of the men's national football team at the 1966 FIFA World Cup led to an upsurge of interest in football from women within England. The Women's Football Association (WFA) was established a few years later in 1969 as an attempt to organise the women's game. That same year, Harry Batt formed an independent English team that competed in the Fédération Internationale Européenne de Football Féminine (FIEFF) European Cup. :43 Batt's team also participated in two FIEFF World Cups held in Italy (1970) and Mexico (1971). Martin Reagan was appointed to replace Tranter in 1979.:100 England reached the final of the inaugural European Competition for Women's Football, after beating Denmark 3–1 on aggregate in the semi-finals. Despite resolute defending, including a spectacular goal line clearance from captain Carol Thomas, the England team lost the first away leg 1–0 against Sweden, after a header from Pia Sundhage, but won the second home leg by the same margin, with a goal from Linda Curl. England lost the subsequent penalty shootout 4–3. Theresa Wiseman saved Helen Johansson's penalty but both Curl and Lorraine Hanson had their spot kicks saved by Elisabeth Leidinge. In 1993, the FA took over the running of women's football in England from the WFA, replacing Bilton with Ted Copeland as national team manager. :105 England managed to qualify for UEFA Women's Euro 1995, having previously missed out on the last three editions, but were beaten 6–2 on aggregate over two legs against Germany. Reaching the European semi-finals granted England a place at the World Cup for the first time. The team advanced from the group stages of the 1995 FIFA Women's World Cup in Sweden, but lost out again to Germany 3–0 in the quarter-finals. Hope Powell became the team's first full-time head coach in June 1998, succeeding her former coach Copeland. The European Championship expanded in 1997 to eight teams and moved from a biennial event to a quadrennial one. England qualified via the play offs for the 2001 competition held in Germany, despite recording their biggest loss (away against Norway 8–0) during qualification, but did not advance past the group stages. England automatically qualified as hosts in 2005, but again did not make it to the semi-finals. Qualification for the World Cup changed for the 1999 edition. European qualifiers were introduced, so that teams no longer needed to rely on advancing to the latter stages of the European Championship. England qualified unbeaten for the 2007 World Cup in China, winning Group 5 in the European qualifiers and recording their biggest win (away against Hungary, 13–0) in the process, ending a 12-year hiatus from the competition. After coming second in their group, they advanced into the quarter-finals to face the United States but lost 3–0. In May 2009, central contracts were implemented to help players focus on full-time training without having to fit it around full-time employment. Three months later, at the European Championships in Finland, England marked their return to the recently expanded twelve team competition by reaching the final for the first time in 25 years. They advanced from Group C to the quarter-finals by virtue of being the top third placed team, beating both the hosts and the Netherlands in the knockout stages on the way to the final. There they lost 6–2 to reigning champions Germany. England reached their third World Cup in 2011, having won Group 5 and their play off 5–2 over two legs against Switzerland. In Germany, they topped Group B – ahead of eventual winners Japan. England were paired with France in the quarter-finals, with the match ending in a 1–1 draw. England had taken the lead with Jill Scott's chip, only to have Élise Bussaglia equalise with two minutes remaining. After extra time ended in stalemate, they lost the ensuing penalty shootout 4–3. Karen Bardsley had saved Camille Abily's initial penalty but misses by Claire Rafferty and Faye White sent England out of the competition. Powell left the role in August 2013 after a poor showing at the UEFA Women's Euro 2013, with England bowing out early at the group stages. Welshman Mark Sampson succeeded Powell as England manager. England qualified for their third successive World Cup in August 2014 with a game to spare, winning all ten matches and topping Group 6. England played their first international match at the new Wembley Stadium, home to the men's national team, in a friendly against the reigning European champions Germany on 23 November 2014. England had not played Germany since their heavy defeat in the European Championship final five years earlier. They lost the match 3–0, marking the 20th attempt at which England had failed to record an official win over Germany. At the 2015 FIFA Women's World Cup in Canada, England lost their opening group game to France but won their remaining group games against Mexico and Colombia, easing through to the last 16 to play 1995 champions Norway. A 2–1 win set up a meeting with hosts Canada in the quarter-finals. Despite facing not only a strong Canadian team but a capacity partisan crowd at BC Place in Vancouver, England progressed to the semifinals of the Women's World Cup for the first time in their history with another 2–1 win, which also marked the first semifinal appearance by any England senior team since the men reached the last four of the 1990 World Cup in Italy. Playing reigning World Cup holders Japan in the semi-finals, England conceded a penalty kick, which Aya Miyama converted past Karen Bardsley. Japan then conceded a penalty as Yuki Ogimi clipped Steph Houghton and Fara Williams slotted it past Ayumi Kaihori to level the game. However, in the last minute of the game, Laura Bassett scored an own goal to send Japan through to the final. England eventually finished in third place by beating Germany 1–0 after extra time after a Williams penalty, their first time beating their archrivals in the women’s game. It marked the best finish for any England senior team since the men’s team famously won the 1966 World Cup as hosts. England qualified for the UEFA Women's Euro 2017 in the Netherlands and won all three of their group games at the tournament. England beat France 1–0 in the quarter-finals before meeting hosts and eventual champions, the Netherlands. In the semi-finals, England conceded three goals without reply and were knocked out of the tournament. In September 2017, Sampson was sacked from his role as manager by the FA after evidence of "inappropriate and unacceptable" behaviour was uncovered during his tenure at Bristol Academy. He was replaced by Phil Neville, who had played at Manchester United and Everton and been capped by the England men but had never before held a high-profile managing job. After being appointed manager, Neville's first games in charge were at the 2018 SheBelieves Cup. In their first game, England defeated France 4–1, then drew 2–2 against Germany. They went into the final game against the United States with the opportunity to win the tournament, but lost 1–0. Second place was the highest England had finished at the SheBelieves Cup. England continued with World Cup qualification in 2018. On 6 April they drew 0–0 against Wales. After the qualifying games in June, England and Wales were guaranteed the first two spots in qualifying Group 1, and England's 3–0 win against Wales in August 2018 saw them clinch the group and qualify for the World Cup finals. In the 2019 SheBelieves Cup, England won the tournament for the first time after winning their first match 2–1 against Brazil, drawing 2-2 with the United States and defeating Japan 3-0. England have qualified for the FIFA Women's World Cup four times (1995, 2007, 2011, 2015) and failed to qualify for three competitions (1991, 1999, 2003). The England team reached the quarter final stage on three occasions, losing out to Germany in 1995, the United States in 2007 and France on penalties in 2011. In 2015, however, England earned the bronze medal for the first time, under Mark Sampson, by beating Germany in the third place play-off. England first entered the UEFA Women's Championship in 1984, reaching the final that year and in 2009. The team have reached the semi-finals on three other occasions (1989, 1995, 2017), but failed to make it out of the group stages in three other editions (2001, 2005, 2013). England did not qualify in 1989, 1991, 1993 and 1997. **Red border colour denotes tournament was held on home soil. England do not participate in the Women's Olympic Football Tournament, as the country does not have its own National Olympic Committee (NOC). Members of its team have played for the Great Britain women's Olympic football team at the 2012 Summer Olympics. Since England falls under the jurisdiction of the British Olympic Association, remit for an Olympic football team requires support from all four Home Nation associations. The Scottish Football Association (SFA), the Football Association of Wales (FAW) and the Irish Football Association (IFA) have all previously objected to the premise over fears that the team would erode the independence of their individual football associations. Caps, goals, and recent players may be outdated or incorrect, as the FA does not maintain an easily accessible database of historical statistics. The following 23 players were named to the squad for the friendly against Spain on 9 April 2019. Carol Thomas was the first player to reach 50 caps in 1985, before retiring from representative football later that year, having amassed 56 caps. Fara Williams holds the record for England appearances, having played 165 times since 2001. She overtook previous record holder Rachel Yankey in August 2014, in a friendly against Sweden. Yankey had passed Gillian Coultard's 119 record England women caps in September 2012, in a European qualifying match against Croatia, and Peter Shilton's 125 record England international caps in June 2013, in a friendly against Japan. Alex Scott is currently the second highest capped female England player with 140 caps, followed by Karen Carney with 132 and Casey Stoney with 130. Rachel Yankey has the fifth highest number of England caps. Kelly Smith has scored the highest number of goals for England, with 46 over a twenty-year international career. She surpassed Karen Walker's 40 goal record in September 2010, in a World Cup qualifying play off against Switzerland. All times are listed in GMT except where noted. ^ a b Gregory, Patricia (3 June 2005). "How women's football battled for survival". BBC Sport. Retrieved 17 March 2015. ^ a b c d e Lopez, Sue (1997). Women on the ball: a guide to women's football. London: Scarlet Press. ISBN 1857270215. ^ "Coppa del Mondo (Women) 1970". Rec.Sport.Soccer Statistics Foundation. Retrieved 17 March 2015. ^ "Mundial (Women) 1971". Rec.Sport.Soccer Statistics Foundation. Retrieved 17 March 2015. ^ "Women's Football" (PDF). Culture, Media and Sport Committee. p. 3. Retrieved 21 March 2015. ^ Williams, Jean (2003). A Game for Rough Girls? A History of Women's Football in Britain. London: Routledge. p. 36. ISBN 1135136149. ^ Mitchell, Paul. "The first international football match". BBC. Retrieved 9 April 2015. ^ Croydon, Emily (7 July 2013). "Women's Euros 2013: Women's football's forgotten heroines". BBC Sport. Retrieved 17 March 2015. ^ Saffer, Paul. "1984: Sweden take first title". UEFA. Retrieved 17 March 2015. ^ Leighton, Tony (19 May 2009). "England's shoot-out jinx begins – England, 1984". The Guardian. Retrieved 21 March 2015. ^ Saffer, Paul. "1987: Norway victorious in Oslo". UEFA. Retrieved 17 March 2015. ^ Saffer, Paul. "1995: Germany establish upper hand". UEFA. Retrieved 19 March 2015. ^ "FIFA Women's World Cup – Sweden 1995". FIFA. Retrieved 19 March 2015. ^ a b "Hope Powell sacked as England women's manager". BBC Sport. 20 August 2013. Retrieved 17 March 2015. ^ "Germany too strong for England". BBC Sport. 30 June 2001. Retrieved 21 March 2015. ^ Oatley, Jacqui (14 June 2005). "England excitement all over too fast". BBC Sport. Retrieved 21 March 2015. ^ Leighton, Tony (8 September 2007). "England talk up World Cup chances". BBC Sport. Retrieved 18 March 2015. ^ Leighton, Tony (28 October 2005). "England's record victory boosts World Cup credentials for China". The Guardian. Retrieved 24 March 2015. ^ "USA send England out of World Cup". BBC Sport. 22 September 2007. Retrieved 18 March 2015. ^ Leighton, Tony (14 May 2009). "FA boosts England's women's team with central contracts". The Guardian. Retrieved 17 March 2015. ^ Williams, Jean (2011). "Woman's Football, Europe and Professionalization 1971–2011" (PDF). De Montfort University. pp. 72–73. Retrieved 24 March 2015. ^ Ashenden, Mark (10 September 2009). "England 2–6 Germany". BBC Sport. Retrieved 17 March 2015. ^ Leighton, Tony (21 August 2010). "Kelly Smith goals help England to 4–0 win over Austria". BBC Sport. Retrieved 18 March 2015. ^ "Swiss Women 2–3 England Women". BBC Sport. 16 September 2010. Retrieved 18 March 2015. ^ Stevenson, Jonathan (5 July 2011). "Women's World Cup: England 2–0 Japan". BBC Sport. Retrieved 18 March 2015. ^ Ashdown, John (9 July 2011). "England lose to France on penalties in Women's World Cup quarter-final". The Guardian. Retrieved 17 March 2015. ^ Leighton, Tony (17 September 2014). "England Women thrash Montenegro 10–0 in qualifier". BBC Sport. Retrieved 17 March 2015. ^ Thompson, Anna (23 November 2014). "BBC Sport – England 0–3 Germany". BBC Sport. Retrieved 17 March 2015. ^ "Deutschland vs England" (in German). German Football Association. Retrieved 17 March 2015. ^ "England's Laura Bassett's tears bring back Italia 90 memories". BBC Sport. 2 July 2015. Retrieved 5 July 2015. ^ "Women's World Cup: Germany Women 0–1 England Women". BBC Sport. 4 July 2015. ^ "Women's Euro 2017: England knocked out in semi-finals by Netherlands". BBC Sport. 3 August 2017. Retrieved 26 May 2018. ^ "FA terminates Sampson's contract". The Football Association. Retrieved 26 May 2018. ^ "Phil Neville's start as England women's coach: Three reasons to be positive and three causes for concern". 9 March 2018. Retrieved 23 July 2018. ^ "Standings". Retrieved 23 July 2018. ^ Pearlman, Michael (31 August 2018). "England beat Wales to reach Women's World Cup finals in France next year". BBC Sport. Retrieved 14 March 2019. ^ Sanders, Emma (5 March 2019). "Japan Women 0–3 England Women". BBC Sport. Retrieved 14 March 2019. ^ "Football Association wants Great Britain sides at Rio Olympics". BBC Sport. 3 March 2015. Retrieved 25 March 2015. ^ "England squad named for opening 'Road to France Series' games with Canada and Spain". www.thefa.com. ^ Dunn, Carrie. "From sleeping rough to England's caps record: the inspirational story of Fara Williams". Eurosport. Archived from the original on 2 April 2015. Retrieved 21 March 2015. ^ "Rachel Yankey breaks Peter Shilton's 125 England caps". BBC Sport. 26 June 2013. Retrieved 21 March 2015. ^ "Smith's six of the best". FIFA. 4 February 2015. Retrieved 21 March 2015. ^ a b "Fara Williams". The Football Association. Retrieved 2 September 2017. ^ "Alex Scott". The Football Association. Retrieved 2 September 2017. ^ "Karen Carney". The Football Association. Retrieved 2 September 2017. ^ "Casey Stoney". The Football Association. Retrieved 2 September 2017. ^ "Rachel Yankey". The Football Association. Retrieved 2 September 2017. ^ "Kelly Smith". The Football Association. Retrieved 18 March 2015. ^ "Walker announces retirement". BBC Sport. 3 June 2003. Retrieved 18 March 2015. ^ Galvin, Robert. "Hope Powell". National Football Museum. Archived from the original on 8 August 2011. Retrieved 21 March 2015. ^ "Eniola Aluko". The Football Association. Retrieved 11 June 2017.